Dwarf, bushy plants for bedding and in pots.available in 5 colors . 40 seeds in packet. The earliest, largest-flowered and most vigorous O.P vinca comes with XP seed quality, making it easier to grow and more appealing at retail. 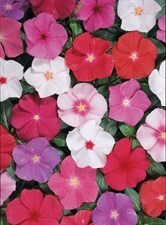 Pacifica XP varieties deliver a tight, 5 to 7-day flowering window and uniform, upright habit across all colours. It’s the only vinca series on the market with colours covering all top sellers plus novelties, including the only true Red. Outstanding in hot, dry and sunny conditions, these durable, stress-tolerant plants meet the increasing consumer demand for water-wise, heat-loving crops.